Place the pork mince into a large mixing bowl, grate the fennel bulb and courgette into the bowl. Add all the other ingredients and seasoning, adding the egg last. Combine all the ingredients well, using your hands is ideal. Divide the mixture into 12 parts. Roll each part into a ball and flatten into a patty with your hands. 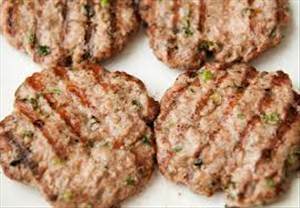 Place the patties on a plate, cover and refrigerate for at least 15 minutes. When you are ready to cook the burgers, place on a baking tray and grill at 180 °C for 20-25 minutes, turning once. There are 154 calories in 1 serving of Pork Burgers. Calorie Breakdown: 57% fat, 20% carbs, 23% prot.